Welcome to Brimz Clip and Flip Eyewear online store! Flip them down when you need them, flip them up when you don’t. Golfing, fishing, boating, playing ball, or doing any non-contact outdoor activity. 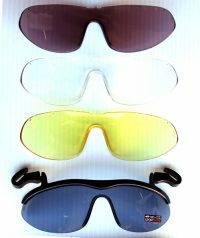 If you wear a sport’s cap or visor, then these are without a doubt the most unique, comfortable, and innovative pair of clip-on, flip-up sports sunglasses you will ever own! Is sun glare killing you? Are you tired of losing your sunglasses? How many pairs of broken sunglasses this year? Is the sun your worst enemy during day time activities? Tired of sunglasses sliding down your nose? Do you wear a sport’s cap? Then it’s time you buy BRIMZ Clip And Flip Eyewear! Since they are attached to your cap or visor, you will always know where they are! What more could you possibly want in sports sunglasses? Different colors and lenses? We have both! Scratch & shatter resistant, they are virtually indestructible. They fit over most prescription glasses. to the ears or nose. Because there are no ear pieces to adjust and the glasses don’t touch your face, they adjust to it! © 2018. All Rights Reserved. Created by Hits-Me Inc.